Since the mid 1970’s the character of Longyearbyen has gradually shifted from mining camp to family society. It has been the government policy to normalise the local society. What was it that was so abnormal, and what did this new Svalbard policy consist of? At the beginning of the 1970’s Store Norske was in crisis. Both the known reserves of coal and the coal prices were low. The Norwegian State had to go in with large funds in order to save the company from bankruptcy and ended up having to take over virtually all the shares in 1976. This was in the middle of The Cold War; it was important to maintain Norwegian settlements and activity in Svalbard. Now that The State owned Store Norske it was no longer politically acceptable for Longyearbyen to remain a company-town. In 1975 the authorities decided on a normalisation of the local society. It was to be a family community with better welfare and public services. In 1976 the state took over the school that Store Norske had run, and expanded it to include sixth-form education. In 1981 the hospital became state-run. Institutions such as The Post Office, the Telecommunications and The Governor were heavily expanded. In 1981 Longyearbyen was connected to the Norwegian telecommunications network via satellite, and a few years later direct-sent television arrived. One thing that made Longyearbyen abnormal, was the almost complete isolation during the winter half of the year. When the airport was built in 1974 and officially opened the following year, it was a watershed in Svalbard’s history. With the planes fresh food, newspapers, television programmes on videotape, friends and relatives arrived; with it also came influenza, bureaucrats and members of parliament. The airport was, perhaps, the most important element in the modernisation process. Better communications had both positive and negative effects. Many of the Svalbard veterans missed the calm, stability and solidarity that characterised Longyearbyen before the planes began to arrive. During the 1970’s and 1980’s there was an increase in the building of family apartments, so that not only the officials, but also the workers in Store Norske were able to live with their families in Longyearbyen. The workers’ barracks in Sverdrupbyen and Nybyen were gradually vacated, and in 1985 the refectory (Stormessa) was closed. 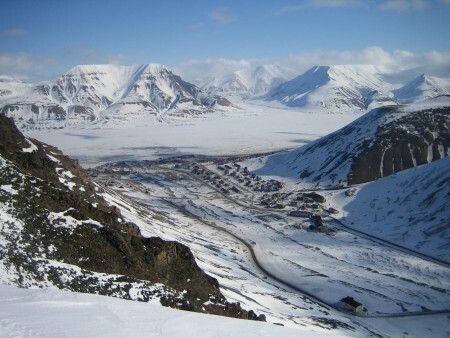 The settlement in Lia expanded – completely new neighbourhood in Longyearbyen. The State decided that its employees should have their families with them. Even though Longyearbyen was numerically male-dominated until the 1990’s, the percentage of women and children steadily grew. It affected the society; soft values came more to the fore. Longyearbyen changed character: a town centre developed with a post office, a bank, shops and a café. The mining influence became less. When the aerial cableway was closed down in 1985, there was no longer much to be reminded of the mining operations. At the end of the 1980’s the coal industry was again in crisis. The State was annually using over 100 million kroner in subsidies for Store Norske. Longyearbyen needed several legs to stand on. An extensive search was set in motion in order to develop new and profitable businesses, particularly those connected with tourism, trade and service. The responsibility for the infrastructure was separated out from Store Norske in its own company, Svalbard Samfunnsdrift AS. The research activity increased dramatically, both in Longyearbyen and Ny-Ålesund. Higher education was introduced and UNIS was established in 1993. Through this came a valuable addition to the local society with Norwegian and foreign students. The new activities more than made up for the downturn in the coal company, and Longyearbyen grew. The population almost doubled in 10-12 years. At the same time Store Norske was working on plans for a new and expanded mining operation in Svea. In the course of the 1990’s Longyearbyen took the leap and became a modern and varied family society. It has welfare and services on offer that far exceed those found in a rural area of the same size on the mainland. The changes that have taken place since 1990 are without equal in the history of Norway.